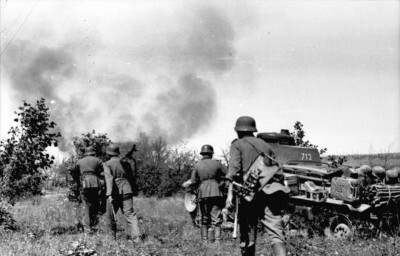 On 22nd June it will have been 75 years since the commencement of Operation Barbarossa, the Hitlerian invasion of the Soviet Union, the war of extermination, pillage and colonization which was to cost the lives of between 24 and 29 million human beings (according to recent estimates): Russians, Ukrainians, Byelorussians and other Soviet peoples who spearheaded the resistance – finally victorious – to Nazi Germany and its allies. It is sometimes forgotten that this aggression was led not only by Germans but by the armies, SS divisions and various other legions of most European countries, under fascist, right-wing authoritarian, or occupation regimes, which were to a greater or lesser extent collaborators. The fact – explicit in the principal Nazi documents – is also neglected that Hitler’s “European project”, the destruction of the USSR and the colonization (economic integration) of a vast “Lebensraum” in the East was the major project of this war. Berlin’s Generalplan Ost provided for deportation beyond the Urals of thirty to fifty million Slavs, of whom a good number were to die – estimates were in the vicinity of thirty millions deaths. In the course of the first year of the invasion around twelve million Soviet prisoners of war were deliberately exterminated through starvation or shooting – a subject generally withheld from us – and 900,000 Jews, as implementation of the “final solution” got underway. In the Baltic countries that are members of the European Union and NATO, and in Ukraine since the political overturn of February 2014, the accent is being placed on “Bolshevik barbarity” to which resistance was mounted by the local nationalisms allied with Germany. The death of millions of Soviet prisoners of war is imputed to Stalin “who had not signed the Geneva conventions” protecting prisoners. The war itself and its mass carnage are attributed to “the twin totalitarianisms” and certain historians and journalists (Russian oppositionists, Ukrainian nationalists) are putting into circulation the German theory according to which Hitler “was obliged” to attack the USSR given the imminence of a Soviet invasion of Europe. The “revisionism” currently fashionable, including in Germany and Central Europe, focuses its attention on the acts of cruelty perpetrated by the Red Army and the anti-fascist resistance. In this new “inventory”, the work of often remarkable historians (notably in Germany) carries little weight with public opinion by comparison with the novels and fiction films, media “revelations” adapted to the political requirements and the new presumed expectation of the “the public”. Who would be so bold as to claim that “the past is unpredictable”?